Consistently delivering quality gas spring and damper solutions on-time and around the Globe is what we do. As a leading UK manufacturer of gas spring and damper solutions we know the importance of delivering our products to you on-time, wherever in the world you need them. With this in mind, we are proud to have a world-class On-Time Delivery record of 99.4% – this being a factor which sets us apart from the competition. Do you have tight deadlines to meet? This is not a problem, we are here when you need us and are used to working with customers who have tight deadlines. Working with customers around the world from concept design right through to completion, we offer practical solutions to suit your gas spring and damper requirements. Understanding there is often a number of stakeholders in any given project, we recognise it is crucial our customers work with reliable additions to their operation – we can, and do, confidently state we are a reliable addition to our customers’ operation – with this customer-centric approach spanning across all aspects of our business. These qualities further solidifying what makes us more than just a manufacturer of gas springs and dampers. We’ll deliver a quality engineered solution to you on-time. Visit our Products Page to view our range of motion control solutions. Understanding the importance of answering commonly asked industry questions regarding gas springs and dampers, we have teamed up with numerous publications across engineering and manufacturing to provide high-quality content to the discerning design engineer. This continuing our mission to be more than just a manufacturer of gas springs and dampers. Often finding the same questions regarding gas springs, dampers and motion control solutions being asked, we have teamed up with leading publications to put our content answering these questions in front of design engineers world-wide. To begin with, we have compiled four whitepapers. The first of these whitepapers has been written as a guide to understanding the basics of gas spring application; providing the reader a basic understanding of the workings and terminology used when specifying gas springs and dampers. This whitepaper also describes the differences orientation and damping expected dependent on the mounting position chosen. The following three whitepapers have been written by engineers, for engineers. These technical whitepapers include a two-part technical overview, discussing ‘forces’, ‘effect of rod diameter’, ‘effect of rod insertion’ and ‘effects and limits of temperature on gas springs’ – with the second of the technical overviews covering ‘damping’, ‘metering and extension speeds’, ‘friction and P1 – P4 charts’, ‘force and force ratios’ and ‘oil levels’. Following on from our technical overview guides, Technical Director Matt Warne has provided an in-depth technical whitepaper on gas spring mounting. This whitepaper covers a wide variety of areas including ‘handling forces’, ‘mounting positions and gas spring sizing’, ‘mounting orientations’, ‘mounting – crossover, self-rise and self-close’, ‘mounting – practical application’ and ‘mounting – dampers’. If you would like to offer any feedback on our content or have any questions you feel need answering around gas spring, dampers and motion control, please email support@camloc.com. Any feedback or content ideas are greatly appreciated. You can access and download our whitepapers here Technical Support. We continue our mission for growth, with further investment in a second CNC Lathe machine to increase production capability and flexibility. The DMG MORI Sprint 32|8 is similar to the Lathe machine which arrived in September 2017. Priding ourselves on our capability to design and manufacture bespoke gas springs and dampers to meet exacting requirements of our customers, the new machine enables improved flexibility to fulfil this mission. The new lathe arrived on 7th January, 2019, becoming fully operational and going into action on 16th January, 2019.This being yet another major advancement within our business, to ensure we remain at the forefront of our industry. “Following the proven success of the first CNC Lathe, we decided to bring forward the investment in the second” explains Technical Director, Matt Warne. “Having access to a second lathe has enabled us to bring forward new product development, plus improve our flexibility to tailor customer specific solutions. Reducing specialist component lead-times means we are better able to meet customer needs with this being another step forward in adapting solutions to meet customer requirements” added Matt. Understanding the importance of remembering those who served, sacrificed and changed our world, this year we hosted a raffle to mark a century since the end of WW1. The Poppy Appeal is the Royal British Legion’s largest fundraising campaign, held each year in November, deemed the ‘period of remembrance’. This year (2018) being a notable one, as it marked 100 years since the end of WW1. The Royal British Legion provides vital support for the Armed Services Community, from supporting veterans in emergency situations or those who may have fallen in debt, to providing well-deserved breaks for service families. This year our Executive PA decided to mark the momentous occasion, we would do more than providing a collection box; instead opting for organising a raffle on top, with all proceeds going to the Poppy Appeal. “A few employees kindly donated prizes, and tickets were sold to the workforces of both Camloc Motion Control Ltd and National Windscreens (who share our building)” Di stated. “I am very pleased to let you know we have received official notification that we raised the magnificent sum of £151.06 for the 2018 Poppy Appeal. A wonderful effort – thanks once again to everyone who participated and donated.” Di went on to say. Fifteen years is a long time when thinking about employment and it’s very rare in the modern day for any employee to remain with a business for such a sustained period of time. Our Production Operator Kay moved to the UK when she was only eight years old, with little grasp of the English language. After finishing school, she went on to fulfill numerous roles before taking on the role of Production Operator at Camloc. We recently caught up with her to see how things have changed and what her highlights have been during her 15 years with Camloc Motion Control. What experience did you have prior to joining Camloc? After leaving school, I opted against going to university or college and decided to get a job in order to provide a steady income for my family. For a while I worked at a shoe manufacturers before becoming a carer in a local care home. I quickly discovered how tough it is mentally to work in that environment and decided that it just wasn’t for me. One of the men I cared for had holes in his shoes so I took it upon myself to get in touch with the shoe company and get him a brand new pair. He was very happy and said to me that he’d never owned new shoes before! I then took time away from work to have my daughter. I was a stay-at-home mum for a couple of years before signing up with a recruitment agency to get back into employment. What first attracted you to Camloc? Whilst with the agency, most of the companies I worked for offered me a job but because I didn’t have a car, they weren’t easy to access. Camloc was much easier to commute to and the hours worked around my children. I joined Camloc as a temp and stayed for three years. After a brief spell away, I was then offered a full-time job at Camloc within the build team. I prefer being involved in the build of the gas springs, so the job specification definitely attracted me back. What has changed since joining Camloc 15 years ago? A lot has changed. New machinery, changes to the factory and we now design and manufacture a wider range of gas springs. I was saying just the other day that often we won’t work on one type of gas spring for a while and then a week later, we receive a large order for them – typical! When I first joined the company, we regularly received substantial orders for pistons to go into game machines but now, the work is far more varied. I prefer the variety though because it means that every day is different. I love that we all get on and the team feels like an extended family – it makes life a lot easier. Everyone help out with jobs such as getting the oil filled properly and because of the brilliant team ethic, it ensures that orders are fulfilled on time. One example of this is when the line one machine broke down. We struggled without it but we still managed to fulfill orders on time by pulling together as a team. You don’t see that togetherness at a lot of other companies. Why have you stayed with Camloc for 15 years? I love what I do and the people I work with! All of this has resulted in me becoming very settled and comfortable here. If I didn’t feel comfortable then I wouldn’t be here 15 years later. I said to my daughter recently “I’ve done 15 years and look I have a certificate”. Her response was “well done mum, you can do another 15 years now!” (laughs). On behalf of everyone at Camloc Motion Control, we would like to extend a sincere thank you to Kay for her 15 years of service. We look forward to having her with us for another 15 years! Comments Off on We mark a special milestone for Production Operator Kay as she celebrates 15 years with Camloc! We have recently expanded our team with the appointment of Distribution Channel Sales Manager, Richard Parker. With over eight-years experience in commercial and construction sales recruitment on a regional and national level and a further six years in external territory-based sales – Richard brings a wealth of experience in account development and new business generation to the role. After four years with RS Components, Richard has joined our Sales Team and will be reporting to company Director Andy Hubbard – who was very impressed by Richard at interview stage. “Richard comes equipped with a wealth of transferable skills and experience that he will be able to put to good effect at Camloc in order to benefit our customers and our business growth,” said Andy. Day-to-day responsibilities for Richard include the strategic identification of potential new markets, searching for appropriate distribution partners and value-added resellers, as well as contract negotiation and management. His new role also requires him to source new potential end-user clients to add to Camloc’s strong portfolio of customers. Richard has been impressed with our internal processes and procedures and has praised the company’s strong values for quality and good customer service which sit at the heart of everything we do. “Camloc has a very customer-centric approach and holds a respected reputation for manufacturing high-quality products – while continually supporting its staff and constantly meeting customer demand,” said Richard. A thank you from LOROS following five years of donations from Camloc! 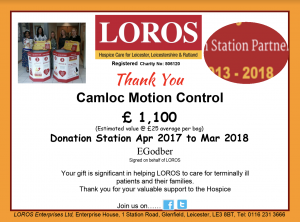 Charity remains a primary focus for us here at Camloc, as we continue to support LOROS with their donation station initiative. LOROS faces the momentous challenge each year of raising a minimum of £7.7 million, to ensure they can continue to provide free, high-quality care tailored to the needs of each individual patient. A large percentage of this is reliant on support from local communities. We first partnered with LOROS in 2013 by getting on board with their donation station initiative, with this currently being housed in the canteen. Since partnering, we have encouraged all employees of Camloc to get involved by donating any of their unwanted goods. Each bag is worth £25 on average; this offers the potential for an hour of patient care, an aromatherapy reflexology or massage session, or collection of two patients from home for day therapy. “I would like to thank everybody who has, and who continues to take part in the LOROS donation station initiative” remarks Financial Director, Julie Barker. “Having raised £1,100 over the last year is a fantastic effort, which will provide ample care for those who need it. LOROS continues to do fantastic things and we shall continue to proudly support them” Julie states. Comments Off on A thank you from LOROS following five years of donations from Camloc! Comments Off on The race is on for three Camloc employees taking part in a 52-mile ultra-marathon! Following a successful partnership in 2017, we have recently agreed to once again nurture future industry talent through our exciting work supporting Leicester College’s Industrial Cadets scheme. The programme offers experience to young people taking part in the nationally-recognised programme which forms part of the Prince’s Trust’s Engineering Education Trust – set up by the Prince of Wales. It allows students nationwide to benefit from work experience across the in-demand skill areas of Science, Technology, Engineering and Mathematics (STEM). Through the trust, cohorts of young people are able to gain valuable experience with the aim of equipping “all Prince’s Trust young people with the STEM skills needed for employment”. A group of 35 engineering students worked with us for one week in 2017, learning directly from company directors Andy Hubbard and Matt Warne about our specialist products and how they are manufactured. They were required to complete a 30 hour project as part of the programme – spending the first and last day of the week on-site with us – benefiting from a tour of the premises and carrying out a Q&A session with Andy and Matt. Following the success of last year’s programme, both ourselves and Leicester College have renewed our working relationship in order to offer this innovative opportunity to another cohort in the spring of 2018. “We put a high value on the time taken by the team at Camloc accommodating and educating our cadets,” said Gemma Jackson, Employability and Enterprise Manager at Leicester College. “Our students cannot gain this sort of experience in the classroom – it is only by going out into the world of work and learning first-hand from industry professionals that they can truly appreciate the processes and procedures in place for successful manufacture of such intricately engineered products.” added Gemma. For Camloc, being able to offer insights to the next generation is an exciting opportunity, and one that company Director Andy Hubbard is looking forward to – “Last year’s cohort showed immense potential and a keen enthusiasm for engineering and our products,”. “We look forward to welcoming this year’s group to Camloc in the coming weeks.” added Andy. To find out more about the range of products we manufacture, visit www.camloc.com. Team Leader Jason Ascott, celebrates a quarter of a century with Camloc! A lot can change in 25 years, but one thing that’s remained consistent at Camloc over the previous quarter of a century is the presence of our experienced Team Leader, Jason Ascott. Jason started his career working as an apprentice mechanical fitter in 1986, building a wide range of machine tools and transfer lines. Due to his love for problem solving, after his apprenticeship he went on to build industrial robots. He took a keen interest in Camloc after hearing about a vacancy at the company in 1993 – and has worked for the company ever since. We recently put some questions to one of our longest serving team members to see how his role within the company has changed and what he’s enjoyed about working for Camloc over the last quarter of a century. What has changed since you first started at Camloc, 25 years ago? My role, and what is required in order to ensure we meet demand, has changed within the company – but the company itself hasn’t changed too much. Yes, people have come and gone and technology has advanced but everybody is recognised as an expert in what they do and treated as an equal – regardless of their role. The reason why people stay at Camloc for so long is because of the great people that work here. What have you been involved in over the last 25 years? When I first started at Camloc I was involved in running the machine that injects the gas into the springs. My next role was working as a Maintenance Technician – this role allowed me to go back to college and gain several new qualifications – including a BTEC in engineering. In my first year in this role, I went to America for three weeks in order to smooth out a few inevitable problems for a customer. However, 22 years ago my role was no longer needed and I became Team Leader on shift work at Camloc grinding rods. Now I look after all processes on the shop floor. I really enjoy solving a problem and getting my hands dirty. I’m in charge of all aspects of running the shop floor, so I enjoy the responsibility that comes with my role. I also enjoy working alongside my colleagues – most people have been here for a long time so we’ve developed a great working relationship. For example, Ben Taylor, recently hit 15 years with Camloc, while Carl Payne and Gary Keavney have both been at the company for a decade! Camloc employees are happy and dedicated within their role – which is usually why we stick around for so long! We would like to extend a big thank you and congratulations to Jason for his 25 years service, and to Ben, Carl and Gary for your 15 and 10 years respectively. That’s a combined 55 years of hard work – and we look forward to another combined 55 years service! Comments Off on Team Leader Jason Ascott, celebrates a quarter of a century with Camloc! We have invested in future industry talent by adding new apprentice, Conner Danvers-Rushin, to our in-house engineering team. Eighteen-year-old Conner has taken up the position of Testing and Development Support Engineer and will study at Leicester College two days a week. As part of his apprenticeship, Conner is required to complete a minimum of two years studying at Leicester College. Within his day-to-day role at Camloc, Conner is learning all aspects of product testing, development and engineering in the business – working closely with our Development Engineer of 26 years, John Widger. Conner is excited to be given this opportunity with the company and learn as much as he can from John. Company Director Matt Warne explains how Camloc recognises that investing in the future is vital in an industry where specialist knowledge and expertise is key. And, with a long-serving expert such as John to learn from, Conner could not be in better hands in order to get to grips with Camloc’s processes, procedures and innovative products. We are currently participating in an exciting research and development project working with the University of Bristol. Funded by the Engineering and Physical Sciences Research Council (EPSRC) the project is being lead by Dr Jason Zheng Jiang, a lecturer in dynamics and control from the university’s Department of Mechanical Engineering. It focuses on creating an improved damper design in order to maximise its performance capabilities. “Working closely with Camloc Motion Control as the experts in product design and manufacturing, our overall aim is to improve specialist design techniques and constitute a major step towards application in multiple industrial sectors – including road and rail transportation, civil engineering and aerospace engineering,” explains Dr Zheng Jiang. Along with other commercial partners, we will be actively involved in the development – leading on prototype manufacture – and company Director Matt Warne is pleased with the progress made so far.